The latest release in Regent’s ‘A Year at...’ series takes us to the beautiful cathedral of Exeter for the first recording on the Regent label of this under-recorded choir. It is also the first recording from the choir under the direction of Timothy Noon, who took up the reins as Director of Music in January 2016. This tour though the church’s year unusually begins with a celebration of St Cecilia – the patron saint of music and musicians, with Herbert Howells’s striking paean of praise. 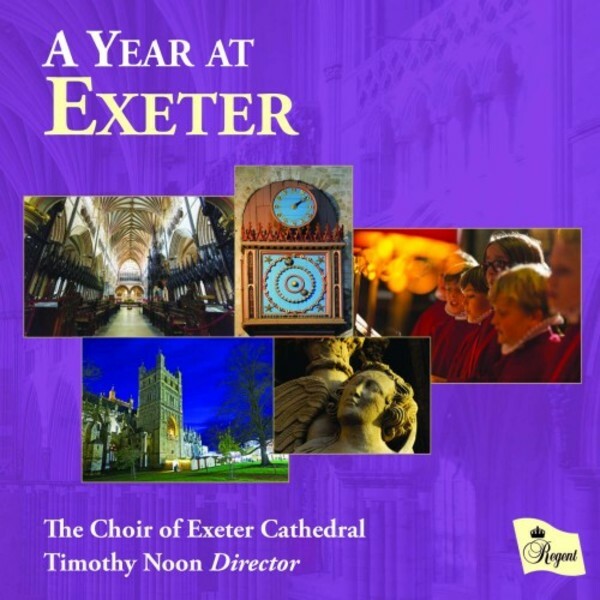 Moving through the church’s year from Advent to Christ the King, a selection of well-loved choral favourites is interspersed with lesser-known works, including the first recordings of Philip Lawson’s ‘Lullay my liking’, and ‘The Lord is King’ by Exeter’s assistant organist, Timothy Parsons. Also relatively unfamiliar is ‘Jesus walking on the waves’ by Anthony Piccolo, a dramatic mini-cantata featuring the words of St Peter to whom Exeter Cathedral is dedicated. The disc ends with Jonathan Dove’s transcendental setting of ‘Seek him the maketh the seven stars’ with its thrilling choral writing and virtuoso organ accompaniment. Exeter Cathedral Choir sings at around eight services each week during term time, maintaining a tradition that has been largely unbroken for centuries. It also has a busy programme of other engagements, which often includes tours (most recently to Austria and Slovakia in 2018), concerts, recordings and radio broadcasts. Recent engagements include Bach’s B minor Mass, St John Passion (both with Charivari Agréable), and Bernstein’s Chichester Psalms. Up to thirty-eight boy and girl Choristers (aged between 7 and 13 years old) sing in the Cathedral Choir. All attend Exeter Cathedral School. They are joined by adults, either Lay Vicars (professional singers who combine their Cathedral duties with other employment in the city) or Choral Scholars (students from the University of Exeter or gap-year singers spending a year at Exeter Cathedral).